Can be frozen raw or thermally processed mushrooms. If you do it by the rules, in winter you can prepare a delicious mushroom stew, fragrant soup, spicy pot roast, mouth-watering Spanish omelette. The most important rule - mushrooms for freezing should be fresh! Young aspen mushrooms and white mushrooms, and russulas, pig, mushrooms and volnushki suitable for freezing during the day. Boletus boletus and need to be processed immediately after collection. For freezing it is better to take small, strong and young specimens, preferably unbroken. From the last two parameters depends on many things - the appearance of fungi after freezing and their taste quality, particularly flavor. Pre-washing them is not recommended. One can only shake their leaves, the ground and the other COP. Mushrooms easily absorb water, which when frozen turns into ice. It is easiest to freeze the mushroom is fresh and whole. Mushrooms with a hat sponge should be frozen, only fresh. These include boletus, white and aspen. Cooked they will become too watery and will lose badly in the taste after thawing. To save space in the freezer, the mushrooms must be cut. While the smallest specimens you can freeze a whole, they serve as a good decoration for many dishes. However, initially they must be strong, otherwise the mushrooms after the defrost will not keep shape. Prepared the mushrooms are spread on the tray in a thin layer and place in the freezer for 12-15 hours. During this time they must have time to freeze. The temperature in the chamber should be maximized. Frozen mushrooms, place in a plastic bag and return to freezer, putting it in normal temperature. Perfect mushrooms for freezing in this way will be mushrooms, mushrooms, forest mushrooms, boletus, chanterelles. This method of freezing will be suitable for broken, lost its presentation, but tasty and fresh mushrooms. Boil them very long - about 5 minutes. Drain mushrooms in a colander and let the water drain out within 30-50 minutes. After the mushrooms can be a bit of squeeze with hands to remove moisture. After that, they must be placed in a clean container or dense pack it and put it in the freezer. Count the number of mushrooms in the container so that one bag or container could you use to cook one dish. You can also freeze and sauteed mushrooms. To do this, clean the mushrooms, fry on a small amount of vegetable oil for 15-20 minutes, until evaporate excess moisture. Fully cooled mushrooms spread out in bags and freeze. So they are not lost during frying of its unmatched fragrance and sweet taste, you can fry the mushrooms on a baking sheet in the oven. For this roast will not even need butter, because the mushrooms will be prepared in its own juice. Mushrooms frozen in this way are ideal as toppings for cakes, pie, chicken. 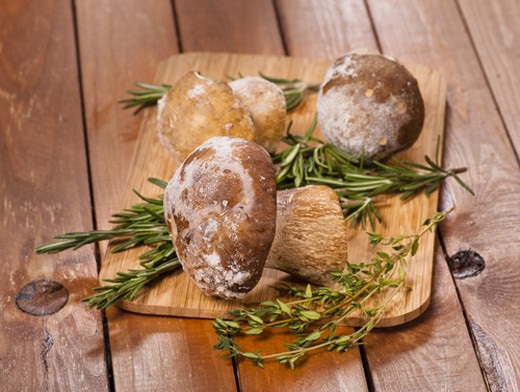 Frozen mushrooms for the winter should be stored at a temperature -18 ° C. Their shelf life is not more than a year. After complete thawing immediately use the mushroom, and in any case do not leave them for later in the fridge. Keep in mind that mushrooms, like any other product, you should not be re-frozen. Otherwise you will get a watery tasteless mess. To defrost mushrooms slowly. To do this, simply place them on the bottom shelf of the fridge and leave it for 12-20 hours.